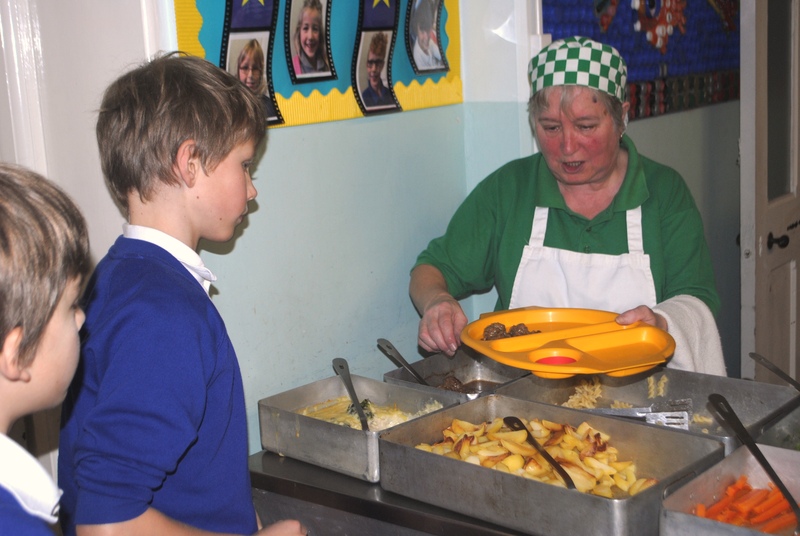 St. Peter’s school offers a free hot meal to all of the children that are in Reception, year 1 and year 2, as well as those who qualify for ‘free school meals’ in other year groups. Children in Key Stage 2 who do not qualify for free school meals, are able to purchase a meal at a cost of £2.15 each day. Alternatively, all children are allowed to bring a packed lunch to school if they prefer. This year we have updated our system with the support of county caterers. At the start of the day, the children are asked what they would like to eat from the menu for that day. They have a choice of two main meals and are given a red or a green band to indicate their chosen meal. At lunchtime, our meals arrive from the kitchens of a local school and the children exchange their band for their lunch. We believe we have a responsibility to assist with the education process through the provision of healthy, wholesome and enjoyable foods – which also meet the ethnic and where possible the dietary requirements of pupils. Our menus match the Nutritional Standards set by the Government and we seek to enable pupils to learn to choose food wisely and achieve a balanced diet. Less fat – we use polyunsaturated pure vegetable oil for cooking, and oven bake foods in preference to frying. Less sugar – we have reduced the sugar content in our recipes. Less salt – we use the minimum amount of salt in our recipes and do not place salt on the dining tables. More fibre – we have increased the fibre in our menus through the use of wholemeal bread and flour, pasta, fresh fruit and vegetable crudités and other items enriched in fibre.